Wedding venues in Queenstown and the surrounding region are unforgettable, for everyone. Getting married on the shores of Lake Wakatipu, or in front of the Remarkables, with such stunning scenery, outdoor weddings are a must... whatever the weather. 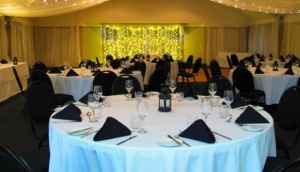 Queenstown wedding venues can be as relaxed, formal, simple or outlandish as you choose. From marrying inside a pretty chapel with a lakeside setting, or a warm and sunny vineyard, to sliding across a glacier with the priest in tow, there's nothing off limits here. Traditionalists will love the lakeside settings, or the private estates, while many restaurants and hotels offer full wedding packages. For something different, you can try a helicopter ride over a glacier for a proper white wedding. There are also a number of wedding planners who can help with every detail of your special day, from venue, celebrant and catering, to entertainment and transport.